The Journey of Gajpati Homes started in the year 2003. In a mere span of few years we have been able to establish ourselves as one of the leading marketing and consulting associates of Large real estate projects in the eastern region of the country. We at Gajpati Homes, from its very beginning have incorporated with ourselves the values of transparency, high morals, honesty, mutual trust and determinded to carry these ideals forever. We are firm believers in Indian Values and Tradition, constantly envisaging them from an organisational stand point. Though this path sometimes make the journey bit tougher, but we have succeeded in emerging as the winner under several unfavorable conditions and still continue to hold up this ideology. We take pride in the fact that our business foundation is completely ruled by the Indian Values, and our Vision is vastly Global, to bring the universe under the way of indian life.....a life that takes one back to the roots globally. Gajpati Homes has a wide vision for expansion, promotion, position and manpower management, which makes them global visionary. This unique combination of INDIAN VALUES, GLOBAL VISION is our core strength and develops a palette of opportunities for ourselves, where we soar higher and higher.Gajpati Homes has ventured into untested territories and has been successful. We never set upper targets for our services.......that limits us. We believe in constant growth and each step is a flight above. 1) People : To be a great place to work where people are inspired to excel. 2) Presence : To have a pan India presence across all major cities. 3) Promote : To promote, market, brand and sell challenging projects successfully. 4) Portfolio : To Work for the most prestigious projects in each of the Indian Cities. 5) Position : To position ourselves as the most preferred marketing associates across the country. Gajpati Homes mission is to be set a new benchmark in terms of quality services and at the same time render a unique buying experience in the buyer mind. Each customer is important to us so we work hard to try and provide utmost care to each individual, ensuring that they can enter into a lifelong bond with us. Company: Gajpati Homes Pvt. Ltd. 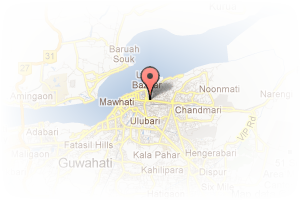 Address: Lokhra Road, Sawkuchi, NH 37, Guwahati, Assam, India. PropertyWala.com » Guwahati Real Estate » Guwahati Brokers / Agents / Consultants » Gajpati Homes Pvt. Ltd. 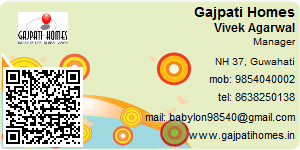 This Broker Profile page for "Gajpati Homes Pvt. Ltd." has been created by PropertyWala.com. "Gajpati Homes Pvt. Ltd." is not endorsed by or affiliated with PropertyWala.com. For questions regarding Broker Profiles on PropertyWala.com please contact us.